TORONTO - Ontario's Liberal government admitted Monday that the cost of cancelling a gas plant in Oakville may be higher than the $40 million they first estimated, something the opposition parties have been saying since last year. "The $40 million is a figure provided to us by the Ontario Power Authority; they did the negotiations, they did the calculations, they provided them to us and we made them public," Energy Minister Bob Chiarelli told reporters. Minutes earlier, the opposition parties were on the attack in question period after an energy expert testified at the justice committee last week that the cost of cancelling the Oakville gas plant could be 15 times higher than the government says. 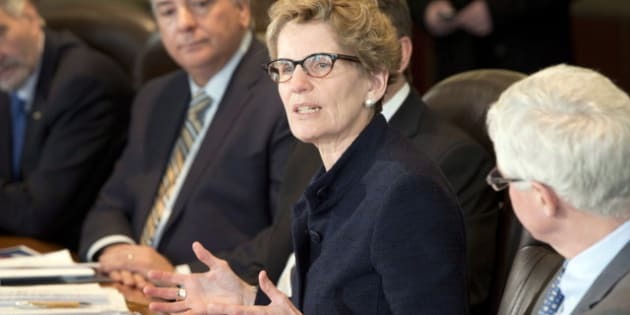 Both the Progressive Conservatives and New Democrats tried in vain to get Premier Kathleen Wynne to say she would stand behind the $40 million figure that the government has been using for months. "Premier, Ontarians want you to stop hiding behind technicalities, legalities, procedure and spin," said PC energy critic Vic Fedeli. "I say to the premier, tell us now because we know that you know: What is the real cost of cancelling Oakville?" The New Democrats followed a similar theme in their questions. "We had very clear testimony last week that that ($40 million) was not a credible number," said NDP energy critic Peter Tabuns. "Premier, will you actually speak to the question and admit that $40 million is not a credible figure for the Oakville gas plant cancellation?" Wynne punted the questions to Chiarelli, who said there would be other witnesses with different points of view on the cost of cancelling the project. He did not mention the OPA's figure could be wrong until later, when he met with reporters. Whatever the final figure turns out to be, Chiarelli predicted there would always be some who dispute it. "I think the figure will be a figure on which there will be a lot of opinion, whatever it is," he said. Chiarelli also cautioned the opposition to wait for an auditor general's report into the cost of cancelling the gas-fired electrical generating station in Oakville and scrapping another one in neighbouring Mississauga just days before the 2011 election. "Governments make decisions, they do accounting and the auditor general looks at it and sometimes he finds it's great, and sometimes he finds that there are errors and it could have been done better," he said. "So let's wait for the auditor general." The Liberals say it cost $190 million to scrap the Mississauga gas plant, which was halted in mid-construction by the party's campaign team. The Tories and NDP say the two plants were cancelled to save Liberal seats in the suburbs west of Toronto, leaving taxpayers on the hook for the controversial decisions. The Liberals prorogued the legislature and threw former energy minister Chris Bentley "to the wolves" to hide the actual cost of cancelling the energy projects, said Conservative Rob Leone. "Premier, will you finally admit the reason for your government's decision to obstruct the work of this house is because you're trying to cover up the true cost of politically motivated decisions," asked Leone. The legislature's justice committee will resume hearings into the cancelled gas plants Tuesday, with testimony from the mayor of Oakville and an official from the Ontario Power Authority.